Please call the office at 760-765-0532 during business hours to set up a new account. Please note that we can only set up an account for new owners. We no longer set up tenant accounts. All new accounts are required to pay a $120 deposit. This is due within 15 days of setting up your account and is refunded after one year of on-time payments. Can my tenant set up an account? We no longer set up accounts for tenants. Bills are only mailed to the registered owner with a copy sent to a property manager, if desired. It is up to the owner to make arrangements with the tenant regarding water. When are bills sent out? We bill on a bi-monthly basis. Bills go out near the beginning of every odd numbered month and are due when received. They become late after the 20th of the month. A late fee will be charged if received after the 20th day. Lock-offs will occur 10 days later, on the 30th day of that month. What time period is the bill for? On each bill, you are billed for your water use from the previous two months, and the "Ready to Serve" service charge for the following two month. When you close your account, you will get a prorated refund for the Ready to Serve fee because it was paid in advance. What happens when a bill is late? Any bill not received by the 20th day of every odd numbered month is late and is charged a 10 percent late fee. If the bill continues to be late, it will be scheduled for shut-off on the 30th day of the month. Two business days before the shut-off, you will receive a 48 hour door hanger notice and will be charged $25. You will always have two business days notice before your water is locked off. For example, if the 30th of the month is on a Monday you will receive your 48 hour notice the previous Thursday. Please call the office with any questions about when shut-off notices will be delivered. If the bill has not been paid by the shut-off date, the meter will be locked-off sometime after 12:00 pm that day. Your account will be charged a $25 lock-off fee. When the bill has been paid your meter will be turned back on. Turn-ons occurring during normal business hours will be charged $25. The night, weekend and holiday turn-on fee is $100. Payments can be made by check or money order sent to our post office box or dropped in the drop box in front of the office (more info here). We also accept credit cards online. I have an unusually large bill and can't pay it all by the due date. Please call the office at (760)765-0532 to make arrangements. A final read is taken at the meter to determine how much water was used from the last billing. Your account is given a prorated credit for the "Ready to Serve" service charge that was already paid from the close of the account to the end of the billing cycle. Your deposit, if any, is applied to your account. A $25 transfer fee is charged to your account. Your final bill may include a refund or an amount due. My tenants have moved out, can you read my meter and calculate what they owe? We no longer perform this service, but we can explain how to read the meter or calculate the bill if you call the office. Houses with an even number address can water on Wednesday and Saturday. Odd number addresses can water on Thursday and Sunday. Irrigation can only occur before 10 a.m. or after 6 p.m. See the details here. Plants in pots are not considered landscaping and are not part of the watering restriction at this time. An ornamental garden composed of flowers and/or other non-edible plants is under the two days a week watering schedule. Gardens that produce edible crops are not part of the watering restriction at this time. How long will these restrictions continue? It depends on future actions the State takes and on how long the drought continues. Yes, but the District will remind customers about the current restrictions the first time we see a violation on the property. A repeated violation will result in a $50 fine. Subsequent violations increase the fine by $100 up to a maximum of $500 per violation. Water districts can also be fined by the State for not doing enough to enforce restrictions. Does it get cold enough to freeze pipes in Julian? Where pipes come up out of the ground and enter the house. Hose bibs in the yard that stick up out of the ground. Water heater piping in outside enclosures. If you know your pipes are not protected and cold weather is expected, you can run a small amount of water (half the diameter of a pencil) at one sink at night to help keep them from freezing. What do I do if I have no water after a cold night? The most common area where pipes freeze is where they come up out of the ground and go into your house. The best way to thaw them is to pour water from the upper toilet tank onto the pipes with a faucet on in the house. What should I do if I'll be gone during the winter? You should winterize your house by shutting off the water at the meter. You should also try to drain the water from your internal plumbing. This can be done by opening the lowest outside faucet on your property with the water off, and allowing air to enter by opening an inside faucet. Compressed air can also be used to help drain water from pipes. Leaks are either continuous (a broken pipe) or cycle on and off (a toilet filling). Both can use a lot of water over a period of time. 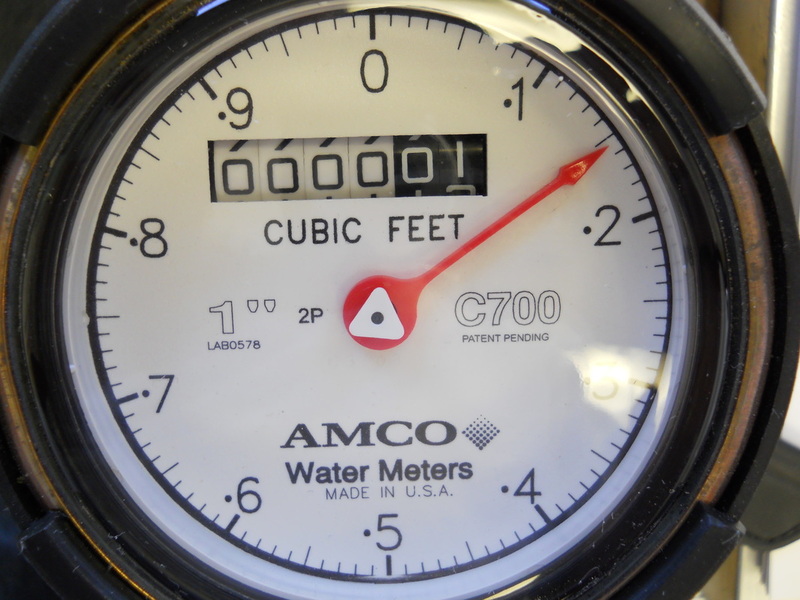 If your usage is higher than normal, check your water meter (see Water Meter section below) for a continuous leak. You can also watch the meter over a period of time to make sure your usage isn't cycling on and off. An easy way to do this is to read the meter before you leave and compare it to the read when you come back a few house later. You can also check the read on the meter with your bill to make sure your meter wasn't misread. Please call the office at (760) 765-0532 if you have any questions. Continuous - Isolate sections of your piping starting with the one furthest away from the meter. If you have a shut-off valve for the backyard, shut it off and check the meter to see if it stopped. You can try the house shut-off valve next. If the leak continues, it is isolated to the area between the meter and the house. Cycling on and off - This is usually a toilet, but can also be an irrigation timer. Try shutting off one toilet at a time and check the meter. Replacing the flapper usually solves this problem. Make sure irrigation timers are set correctly and are not running a default program because of a power outage. Manually cycle through each station and check for missing sprinkler heads or drip emitters. Does the water district fix leaks? Unfortunately, we can only fix leaks in district piping. Once the water goes through the meter and is in the customers piping, the customer is responsible for any repairs. Can I get a water meter for my parcel? Yes, if your parcel is within the District boundary (map). Water mains do not currently run throughout the District, so it is up to the property owner to extend the water main if required, to reach your property. Where are the water mains? If you are considering developing a property in the District, we encourage you to come by the office and talk with the General Manager about the project. What does a meter cost? The charge for a new meter is $12,000 paid to the District, plus hiring a contractor to do the work. The District provides a 3/4" or 1" meter, a check valve, a customer shutoff valve and a concrete box to protect the installation. Please call the office for more information. You are also charged a $32.50/month service charge called "Ready to Serve" ($65.00 bi-monthly). This is charged whether you use water or not. Water use, as calculated above, is added to this amount. Bulk construction water is currently billed at $0.259/cu. ft.
How do your rates compare to what I paid "Down the Hill?" Our water rates reflect the fact that we cannot import water from Northern California or the Colorado River. Because imported water is less expensive that using groundwater, our rates are probably higher. Most water meters are located in a concrete box in front of your property, usually within 6' of the edge of the road. However, there are many houses that have meters in other locations because there isn't a water main in the front of the house. Please call the office at (760) 765-0532 if you need help locating your meter. This is done free of charge. Most houses have a shut-off valve where the water enters the house. You should locate this valve and make sure it is in working condition so that you can shut your water off during a leak or other emergency. Inside the meter box is the Districts' shut-off valve and the meter. There may be a customer shut-off valve there as well. This would be the valve between the meter and your house. This shut-off may also be located just outside the meter box. This is the ideal place to shut your water off when you are gone for extended periods as no part of your piping system would be pressurized. The District has shutoff valves that it sells at their cost that connect directly to the customer side of the meter. Please call the office if you are interested in purchasing one. Do not use the District valve to routinely turn your water on/off. These valves are not intended for repeated use and the homeowner will be billed for the cost of replacing it should it break. I need to do repairs and cannot shut off my water. You can call our office at (760) 765-0532 to have the water shut off free of charge. This is an excellent time to add a customer shut-off valve at the meter. The district has shutoff valves that it sells at their cost that connect directly to the customer side of the meter. Please call the office if you are interested in purchasing one. 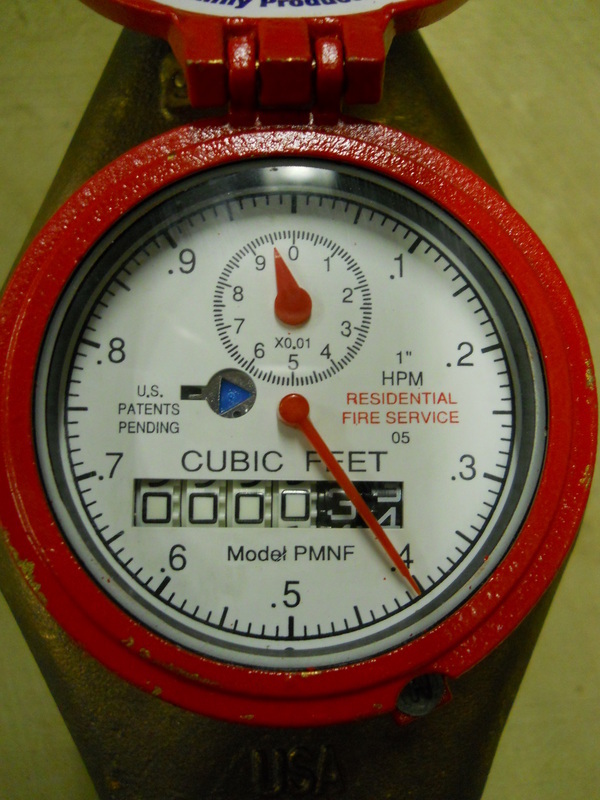 All meters read in cubic feet. The dial is divided into tenths of a cubic foot. Each sweep of the hand equals 7.48 gallons or one cubic foot. The accumulated total is displayed on the register as whole cubic feet. Your previous read is subtracted from this amount to get the total usage for the current bill cycle. Leak Detector - Most meters have a triangle "leak detector" that will spin when even small amounts of water are being used. In the photos above, the left meter has a white triangle in the center and the right meter has a blue triangle. You can confirm that you do not have a continuous leak by checking this when you are not using any water. How do I convert cubic feet to gallons? Multiply the number of cubic feet by 7.48 to get the total gallons. When looking at your bill, you can multiply the number of cubic feet you used by 7.48 and divide by 60 to get the average number of gallons used daily.